A Justice League/Mighty Morphin Power Rangers #1 Review – Wrong Zord!!!! PENCILLER: Stephen Byrne. Cover by Karl Kerschl. As someone who grew up in the ’90s with Mighty Morphin Power Rangers, this is one of the most surreal comic books I’ve ever read. Seriously. Not necessarily in a bad way. It’s just friggin’ weird to see the Rangers next to the Justice League. 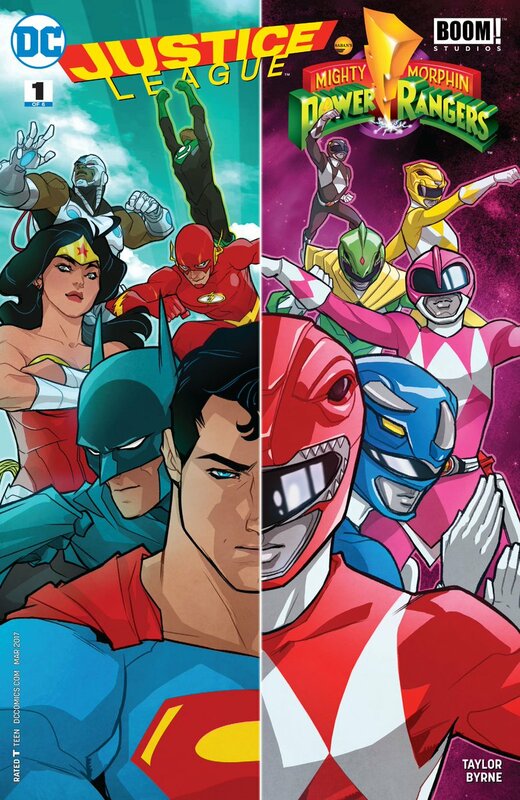 Justice League/Mighty Morphin Power Rangers is the latest inter-brand crossover from DC Comics that I’m not sure anyone asked for. But since they’re willing to try it, why the hell not? Think Green Lantern/Star Trek, Batman/Teenage Mutant Ninja Turtles, the upcoming Green Lantern/Planet of the Apes, etc. Now, thanks to the Command Center’s teleportation system malfunctioning, the Rangers (along with Lord Zedd), find themselves in the DC Universe. While I hate to be one of these people, as a Power Rangers die-hard, it must be said: There’s a giant continuity error in this issue. 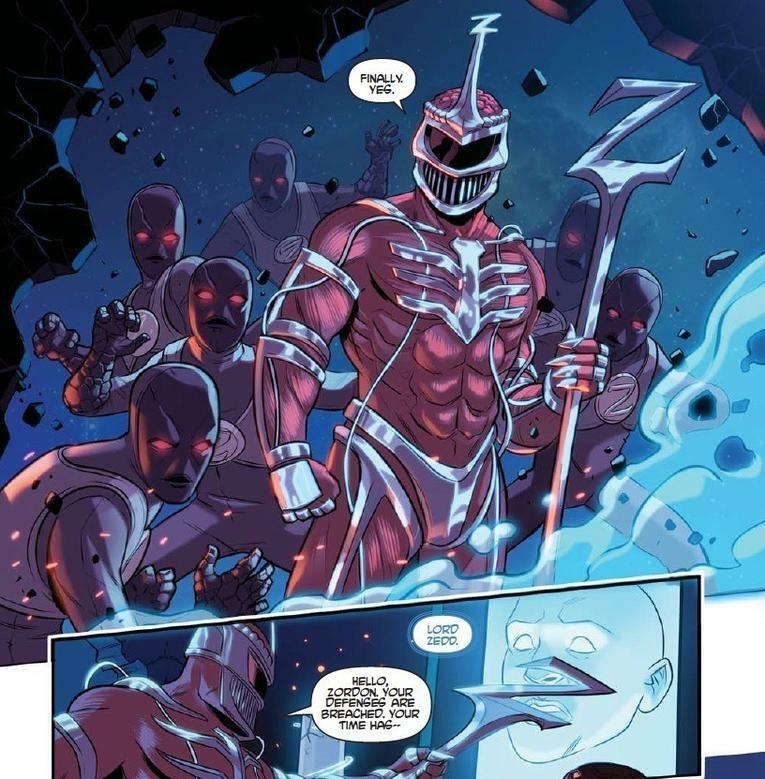 Our villain on the PR side of things is Lord Zedd. A wise creative choice, as he’s the coolest villain to ever come out of the series. But then at the end of the issue, the Pink Ranger calls the Pterodactyl Dinozord. As I’m sure many fans remember, Lord Zedd did away with the Dinozords very early in his tenure. In fact, most of the Dinozords never saw combat against Zedd’s forces. Zack plays a central role in this issue, which I appreciate. It would have been easy to put the beloved Green Ranger in that spot. What I don’t understand is why the crew at BOOM! have been so intent on making Zack a more grim character than he ever was on the show. Kyle Higgins has dropped a hint or two about Zack having problems at home, and we even saw Rita come after Zack to be the evil Green Ranger. This issue builds on that. We kick off with a scene in which Angel Grove has been destroyed, and Zack blames himself. We then learn that he’d had a fight with his parents about “disappearing too often.” Naturally, he can’t tell them he’s doing it because he’s a superhero. There’s nothing wrong with this teenage superhero vs. civilian parents stuff. I actually wish more teen superhero books would go into it. But to those of us who watched the show, Zack is an awkward fit for it. He was always the fun-loving and energetic dancer. That’s not to say he has to be one-dimensional. But a more natural fit would have been Kimberly, the Pink Ranger. It was established on the show that her parents were divorced, and she now has a stepfather. That could be a fine source of drama. One thing I can’t complain about is Stephen Byrne’s art and colors. This guy needs to stay in the Power Rangers universe for awhile. He’s tremendous with all the costumes, and his colors are wonderfully vibrant. There’s a splash page of all the Rangers, minus Zack, teleporting into Gotham City that’s just gorgeous. I enjoy Hendry Prasetya’s work on the main MMPR series. But if he ever needs to step aside, Byrne could jump in and not miss a beat. This side of the issue is obviously pretty heavy on the Power Rangers side. With the Rangers in Gotham, we’ll naturally see more Justice League stuff next issue. We do, however, get a decent amount of Superman and Batman. 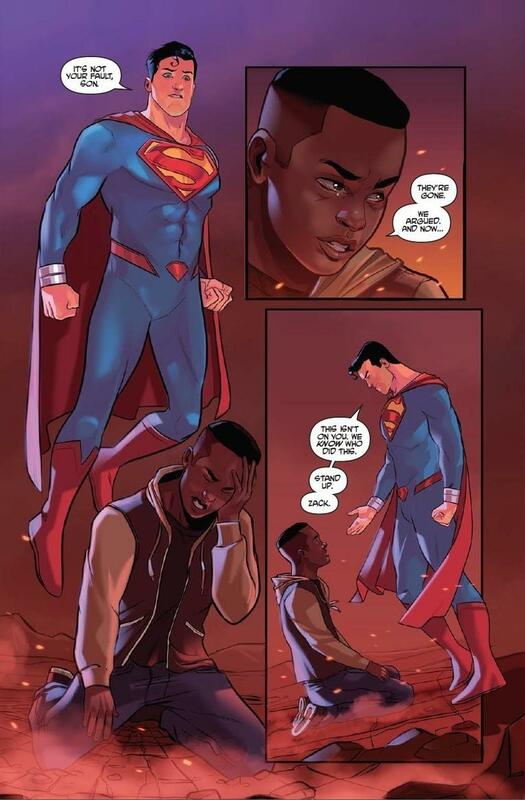 That page where Superman floats next to Zack is, again, so damn surreal. As is seeing Batman block a blow from the Black Ranger’s Power Axe. I don’t imagine we’ll see great things from this book going forward. But I admit, I’m curious to see what they do. Stephen Byrne’s art may be worth the price of admission on its own. But as I think is often the case with these crossovers, after the novelty of the first encounter is gone, the story sort of fizzles out. I can only assume that’ll be the case here. Still, they’ve got me coming back for issue #2. That’s a start. This entry was posted in Comic Books/Graphic Novels and tagged Batman, Black Ranger, Blue Ranger, BOOM! Studios, comic book crossovers, comic book reviews, Cyborg (DC Comics), DC Comics, Green Lantern, Green Ranger, Justice League, Justice League/Mighty Morphin Power Rangers, Justice League/Mighty Morphin Power Rangers #1 (2017), Karl Kerschl, Kimberly Hart, Lord Zedd, Mighty Morphin Power Rangers, Pink Ranger, Red Ranger, Rob Siebert, single issue reviews, Stephen Byrne, Superman, The Flash, Wonder Woman, Yellow Ranger, Zack Taylor on 01/13/2017 by primaryignition.